Our rubberwood desktops are genuine solid wood and are available in finishes from natural to dark. Choose yours to match your decor! Increase storage space at work with our durable, handcrafted teak credenza. Discounted when bought with a desktop and ships fully assembled! The UPLIFT Rubberwood Desktop is available in three colors - natural, dark brown, and light brown. The natural finish is a lighter blonde color with muted wood grain characteristics. Dark brown is dramatic and boasts a chocolate color. The light brown's color falls between these finishes and still features a subtle wood grain. The UPLIFT Rubberwood Desktop is 30" deep and available in the following widths: 48", 60", 72", or 80" wide. Each desktop is 13/16" thick, and won't warp or break thanks to Rubberwood's dense characteristics. The Reclaimed Teak Credenza by UPLIFT Desk is a show stopping piece for your office. The cabinet is handcrafted from reclaimed teak wood and features three drawers and three doors for plenty of room to house your office gear. Reduce, reuse, recycle—and look good while you're doing it with the UPLIFT V2 Rubberwood Solid Wood Height Adjustable Desk. When you're searching for a sit-stand desk that does more and takes into account the long-term needs of the planet, look no further. 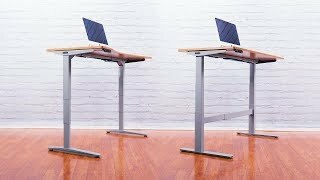 Using the same height adjustable frame that Wirecutter named their "Best Standing Desk," our UPLIFT V2 improves upon features of stability, safety, and functionality, to give you a desk that adapts to your needs and takes you to a higher level of work. Constructed from recycled rubber trees, this desk makes the most out of our natural resources, so you can work at a desk that's as good for you as it is for Mother Earth. You'll have two options for the frame: the UPLIFT V2 or UPLIFT V2 Commercial. No matter which one you choose, work with confidence knowing you're investing in a desk that truly can do more. You can learn more about both the UPLIFT V2 Frame and the UPLIFT V2 Commercial Frame and compare their differences here. Want to see all of our desktop options in one place? Shop our UPLIFT V2 Adjustable Height Desk (V2 or V2 Commercial). Beginning their lives as Hevea brasiliensis trees, we responsibly source lumber from retired rubberwood trees, recycling them into eye-catching desktops you'll have to see to believe. If you're wondering if this is made of rubber, it is not; in fact, this lumber is actually harder than many hardwoods. Measuring in at 13/16" thick, your desk will even have the constitution to stand up to heavier setups, and won't bend or warp under pressure. Natural, light brown, or dark brown finishes let you pick the shade that complements your furnishings. Each stain brings out the beautiful luster in the top's woodgrains, giving yours unique character to enjoy while you work. We make sure no harsh chemicals or dangerous dyes are used, too, so you can breathe easy (and without worrying about polluting your indoor air quality). Rubberwood is also offered on 3-leg and 4-leg desks. For all of our desktops, check out our comprehensive Desktop Brochure. Which Frame Should You Pick? You'll have your pick between two frames for your desk, with the main difference between the UPLIFT V2 and UPLIFT V2 Commercial being their height ranges. For a quick summary of their differences, click here. The UPLIFT V2 Frame has a height range of 25.5" - 51.1" (with a 1" desktop installed). It was the same frame that Wirecutter voted the "Best Standing Desk," and meets ANSI/BIFMA standards for durability. The UPLIFT V2 Commercial Frame has a height range of 22.6" - 48.7" (with a 1" desktop installed). You might have noticed that this commercial-grade desk has a lower starting height, a lower max height, and a larger overall height-adjustment range than the UPLIFT V2 Frame. Created specifically to meet the ANSI/BIFMA G1-2013 height standard, it also meets the ANSI/BIFMA durability standard. The UPLIFT V2 Commercial Frame suits ergonomic working postures for 5th percentile females through 95th percentile males, in sitting and standing postures. Look underneath the UPLIFT V2 Rubberwood Solid Wood Height Adjustable Desk and you'll see 48 separate, patent-pending mounting points that allow you to install accessories directly to your desk. Enjoy being able to attach CPU holders, desk extensions, and even an under-desk hammock to your frame, allowing you to use it in a whole new set of ways (just think of all of the work naps to be had). The system is hidden, so you get to keep a polished look at your workstation. With a sleek design and advanced features found in UPLIFT Desks alone, you'll have a desk that adapts to you in all the right ways. We have many accessories on the line now, with many more in the works, so check back to see what additions are available for your UPLIFT V2. Note: The Under Desk Hammock is only compatible with the UPLIFT V2 Frame, and is not compatible with the UPLIFT V2 Commercial Frame due to its interference with the stability crossbar. When you add the Advanced Keypad to your setup, you get to enjoy more than just quick and easy adjustments. You'll get advanced safety features, too. Installing this smart keypad opens your desk up to anti-collision sensitivity and keypad child lock. With keypad child lock enabled, your desk will only move when you want it to, and with anti-collision, if your desk does ever come into contact with objects or people, it's wise enough to know to stop. Enjoy easy peasy one-touch adjustments on four memory buttons, letting you switch from sitting to standing postures fast. Maximum and minimum heights are also adjustable; set its upper and lower height limits, preventing your desk from hitting shelves above, or file cabinets below, ever again. And if you're concerned about the keypad distracting you—don't. Its auto-dark LED display dims 10 seconds after each use, reducing instances of lights taking your focus away from work. What is "rubberwood"? Is it made of rubber? Rubberwood is a tropical hardwood that is light blond colored and medium-density, sourced from Hevea brasiliensis (their scientific name) or Para rubber trees (their more common name). It's also known as plantation hardwood, parawood, Hevea, or Malaysian Oak. It is not made of rubber, but produces the "sap" that is used to create latex that makes up millions of products sold all over the world. Is rubberwood good for the environment? Rubberwood is eco-friendly because it's made from recycled rubberwood trees. The lumber is then repurposed into our desktops, giving this very durable and beautiful wood a second life. Are these the same type of wood that your solid wood desks are made out of? Although these desktops are handcrafted out of genuine rubberwood and might look like our solid wood desktops, this lumber has a slightly different appearance than our collection of solid wood tops and boasts denser qualities than our reclaimed wood tops. If you need a desktop that combines strength and beauty, our rubberwood desk is a great choice. How reliable is this desktop? Rubberwood is rated at 600 - 650 kg/m3 density at (12% m.c). In layman's terms this means if you require a sturdy desktop that won't warp or break, rubberwood will work for you. I just got the dark rubberwood desk put together yesterday and it's fantastic. Great quality all around, everything went together easily, and the dark rubberwood looks really nice. I'm glad I waited for this top, it was a nice way to get a premium desktop without breaking the bank buying one of the other more "premium" woods. The advanced wiring kit was definitely worth it, now all my wires are tucked away nicely and don't cause any issues when the desk moves. I'm really happy with the purchase so far, and I recommend it! $495.00 List Price: $1,237.00* The list price is the same as the MSRP (Manufacturer's Suggested Retail Price). It may not necessarily be the price at which the product is sold.